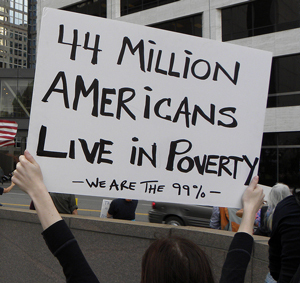 Now, 48 million Americans live in poverty. In the first few years of the War on Poverty, both the number of Americans and the percentage of our population living in poverty decreased dramatically. In large part, the decrease simply followed the trend of the past 15 years. In 1950, the poverty rate was 32.2%. By 1965, the first year during which any War on Poverty Programs began to operate, the rate had been cut nearly in half to 17.3%. In the nearly 50 years since 1966, the first full year of the War on Poverty, the percentage of Americans living in poverty has barely changed. In 2014, the official poverty rate was 14.8% - it was 14.7% in 1966. In 2012, 78% of Snohomish County homeless families were a single mother with her children. Only 4% of homeless families were headed by a single dad. The typical family has two children1. The Federal Poverty Line for a family of three is $20,160. Working full time at the $9.47 per hour Washington State minimum wage (the highest in the nation), you will earn $19,760 a year...or, $1,641 per month. ...working full time, earning $400 less than the Poverty Line. Source: Economic Policy Institute Family Budget Calculator → for the Seattle metro area. People working at the minimum wage face an incredibly tenuous existence. They live on the edge with no margin for even minor disruptions. Nearly 146 million Americans2 – almost half our population - live in struggling poor-but-working class families. They often work more than one job, have no savings and try to survive from check to check - filling in the gaps with food stamps, by going into debt, and looking forward to their annual Earned Income Tax Credit refund (if they worked enough). What happens when our mom misses work because her child is sick, or her car won’t start and she doesn’t have any "spare" money to fix it? Any emergency can become a catastrophic event...a lost job. The poor are often characterized as shiftless and lazy, choosing to be poor and unemployed. As politicians work to cut safety net programs like food stamps and housing assistance, they tell us that benefits like unemployment or "welfare" make for such a comfortable lifestyle that the poor will choose unemployment over work. In reality, the majority of people living in poverty who can work, do work. 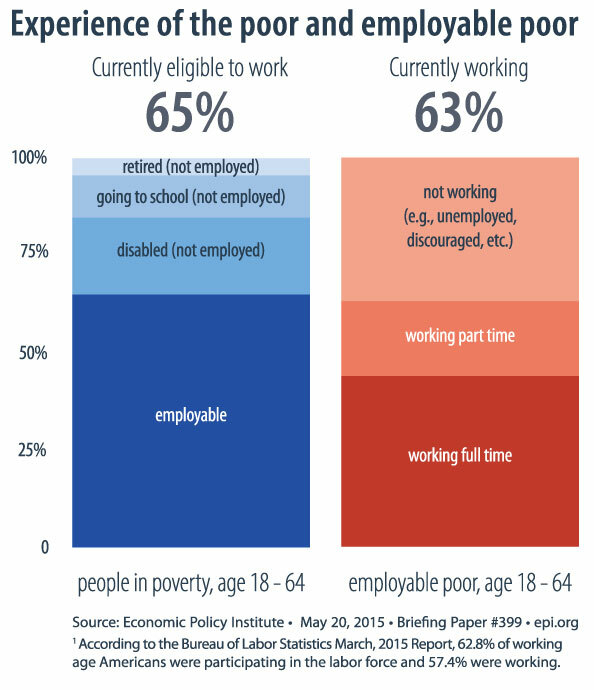 In 2013, 35% of the poor between the ages of 18 and 64 were considered not currently eligible to work because they are retired, going to school, or disabled. The other 65% are currently eligible to work. Among the currently-eligible workers, 63% are working with 44% working full-time. Of the working-age poor eligible for employment, 37% are not working - including 3.3 million unemployed poor people currently seeking a job. In comparison, 63% of all non-poor working age Americans are participating in the labor force and 57% are working. of people who benefit from major government poverty alleviation assistance programs like SNAP (food stamps), Earned Income Tax Credits, housing assistance, and school lunches live in working poor families. is the TANF (Temporary Aid to Needly Families - what used to be welfare) maximum monthly amount a single mother with two children can receive if she has lost her job and is unemployed. TANF is difficult to qualify for, is limited to a maximum of five years in anyone's lifetime, and requires ongoing job search and / or job training commitments. If our single mom with two kids loses her job, it's not difficult to see how she can become homeless. Her total TANF payment will leave her family more than $700 short of her monthly rent. is what a single mother with two children can receive each month in SNAP Benefits (Supplemental Nutrition Assistance Program - food stamps). SNAP funds cannot be used for things like school supplies and personal hygiene products - you need cash for that. 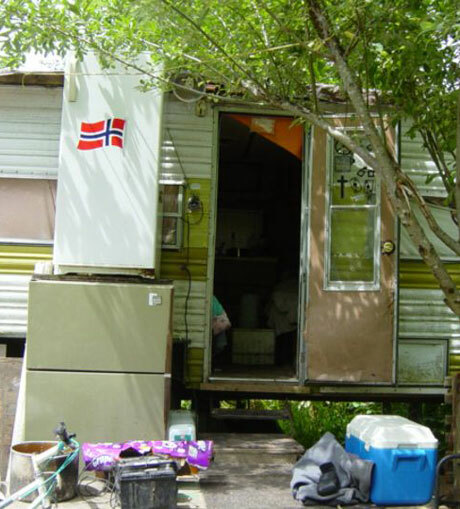 Jamie lived in an abandoned travel trailer with her mother, usually absent, addicted, and abusive father, and two siblings. The trailer had no water, heat, bathroom, or electricity. Jamie’s mother brought her into the Next Step Drop-In Center, asking if we had any warm shoes. Jamie said her feet “really hurt.” When Jamie pulled off her socks her toes were already turning black. Jamie lost her toes to frostbite. Jamie’s mother doesn’t think her family is homeless -- they have a place to live. Offer Friendship, Help, and Hope to our neighbors in need. 3A family is "housing cost burdened" if they spend more than 30% of their income on housing. In September, 2015, a two bedroom apartment at Morning Run Apartments in Monroe rented for $1,195. Working full time, a single parent will have to earn $22.98 per hour to afford (spending 30% on housing) that apartment. Working full time calculation: Washington's minimum wage is $9.47 per hour. Working 40 hours per week for all 52 weeks of the year results in an annual income of $19,670, or $1,641 per month - that's never taking a day or an hour off for the entire year.